Telemarketing techniques on planning how your daily activity will make sure you achieve your new business sales revenue target. How do you know how many leads you will need for your telesales and sales appointment calls? Do you know how many cold calls you'll need to make? How many telesales will you need to close to hit your new business target? When making sales apointments how many calls does it take to gain one confirmed meeting? 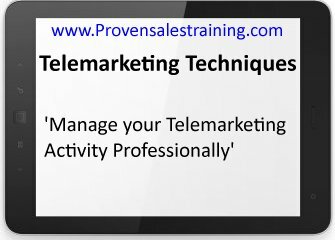 Which areas of your telemarketing activiy would benefit from sales training? When you know all this telemarketing information you are in a position to plan your sales activity and use your time efficiently. So here's how to get to know important facts about your business. 1. What is the average revenue value of the telesales that you close? Divide the total sales revenue value by the number of sales made to achieve that revenue over a period of time. 2. Divide your new business sales revenue target by the answer to No1 above. The answer is how many sales you need in the next 12 months to achieve our target. 3. On average how many calls do you make to gain a sale? For example on average you may make 4 calls for every sale so your conversion rate is 1 in 4. 4. Multiply the answer to No2 by the average number of calls you make to gain a sale, calculated in No3 above. This is the number of calls you need to make, if your conversion rate stays the same, to close enough sales to hit your target. Once you have the above information, about you and your business, you can use it to make these telemarketing techniques work for you. You can also check month on month and year on year if your statistics for your supporting telemarketing actions are improving. This is really important to see if sales training or other investments are working for you. You can plan your telemarketing techniques because you know how many leads you will need, how many sales you need to close, and how many cold calls you'll ned to make. This will also help you to plan advertising and marketing campaigns. You will know how many cold calls you need to make to close enough telesales to hit your new sales revenue target. This helps you to plan your activity. You can take it further by timing calling sessions so you know how long the required number of calls will take and you can allow for this activity in your diary. Play about with your new information, it will give you a real insight into your business. 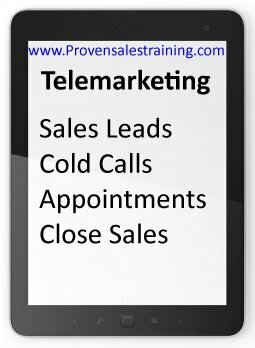 All of the above telemarketing techniques for calculating and planning sales activity can be used by small businesses that make sales appointments to close sales face to face rather than selling over the phone. You can work out your sales appointment call conversion rate just as you did above for telesales calls. This will be the average number of calls made to gain one sales appointment. You can use the same calculation as you used above to work out your conversion rate of appointments made to sales closed. You can decide whether to count follow up sales appointments in the figures or just the first one. As long as you use the same criteria for all calculations the results will be comparable. With this information you will know how many sales appointments you need to make to close enough sales to achieve your new business sales revenue targets. Once you know how many appointments you need to make you can multiply that number by the conversion rate of appointments to calls made and you will know how many calls you need to make. Then you know how many leads you require to allow you to make that number of calls and you can use that number to help plan marketing campaigns. These telemarketing techniques will help you to plan your marketing campaigns so you have the right number of leads coming in at the right time intervals. You know how many leads you are going to need, so where will you get them? You have calculated how many telemrketing calls you will need to make using your conversion rates, so you can plan cold caling sessions in your diary. You know how many sales you need, and you have figures on average sale value, so you can see at all times if you are in front or behind of your target schedule. If you make sales appointments you can see whether you have enough meetings planned for the coming month to gain enough sales to achieve your monthly revenue target. If you don't have the appointments you need you know where to apply your time and resources. Now you have the information you can manage your telemarketing techniques and activity professionally. Going forward how you run your small business or self-employed enterprise, and manage your time, will be based on facts and figures and use a professional sales plan to achieve your new business sales target. You can seek sales training on the specific activities that need improving. You will do the right amount of each sales activity to support your drive to close sales. No more guesswork, always know which telemarketing actvity you should focus on, and have a full plan for your success. The impact of actions that you take to improve your skills can be measured and return on your time and investment can be assessed. To increase your skills see the sales training courses below that I've developed and used with both telemarketing and telesales teams. Create an effective sales pitch covering the whole process from Introduction Stage to Closing the Sale. This sales training course works for both telesales and face to face selling. You learn to create a script using your own words and phrases. It's specific to your products and services, and to your prospects and marketplace. Step by step instructions so it's great for people new to sales. An exercise program that takes inexperienced people through the selling process. Create your cold calling scripts for making sales appointments. If you don't like making first contact with potential new customers this course is for you. I've used it to help field sale people fill their appointment diaries. And as a telemarketing technique for non-sales people to learn how to make cold calls. Step by step training means you don't need any experience and because you use your own words your knowledge of your product or services can be used to great effect. The exercise program will show you how to create a structure for appointment calls onto which you can add your specialised experience.